We’ve been reading a handful of Valentine’s themed books over the past week and a half. These are some of my favorites, but I think my most favorite out of this bunch is “Love Monster and the Perfect Present”. One other book that I need my own copy of is “Love Splat,” which is a super cute Valentine’s Day story also that touches on showing someone you love them even more so than in physical gifts. One thing I loved about children’s literature is that there are great messages in children’s books and insights we can all glean from them. 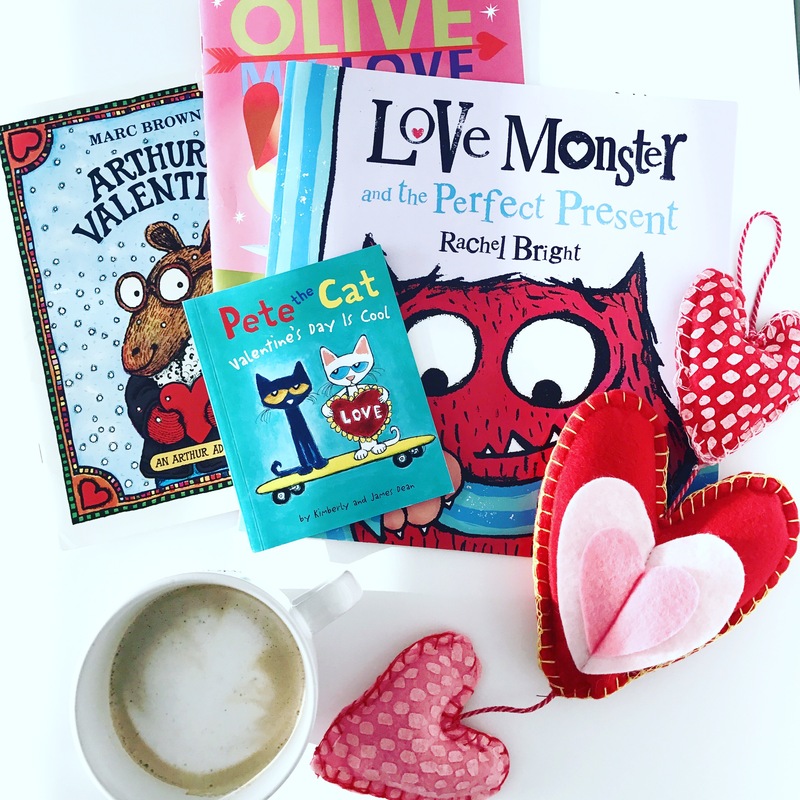 Below is a list recapping some of these stories, along with a craft idea you can do with your little ones after reading Love Monster and Love Splat. I did both with my students last year, and both might’ve been my favorite art projects we did all year! 😊 Happy Saturday everyone! This story is about a little monster who is on the search for the perfect present to give to the girl monster he admires. What he finds while on his search ends up becoming so much more meaningful than any gift a store could offer. Pete the Cat is a wonderful series that children love. Pete is a funny cat, and similar to Love Monster, Pete is trying to figure out the perfect gift for a friend. This turns in to making the perfect gift not only for his friend, but for his other classmates, his teacher, the bus driver, crossing guard, and even his mom 😊. I love that this story emphasizes the importance of finding all the little ways others around us show they love and care for us every day and celebrating them and showing appreciation for them. This is a fun story about Arthur trying to figure out who his secret admirer is. He tries to figure out if it’s Fern, Sue Ellen (who he hopes it is 😊), or his best friend Buster trying to play a prank on him. This is an exciting and slightly suspenseful story to read aloud to with your babes! Splat the Cat is another popular series like Pete the Cat. They are funny stories and children really like them. In this story, Splat is trying to win over his admirer, Kitten, from his class. Although, he’s not the only one! His rival, Spike, is also seeking the love of Kitten. This funny tale will make you laugh and keep you on your toes wondering if Splat’s heartfelt valentine will win Kitten over in the end! 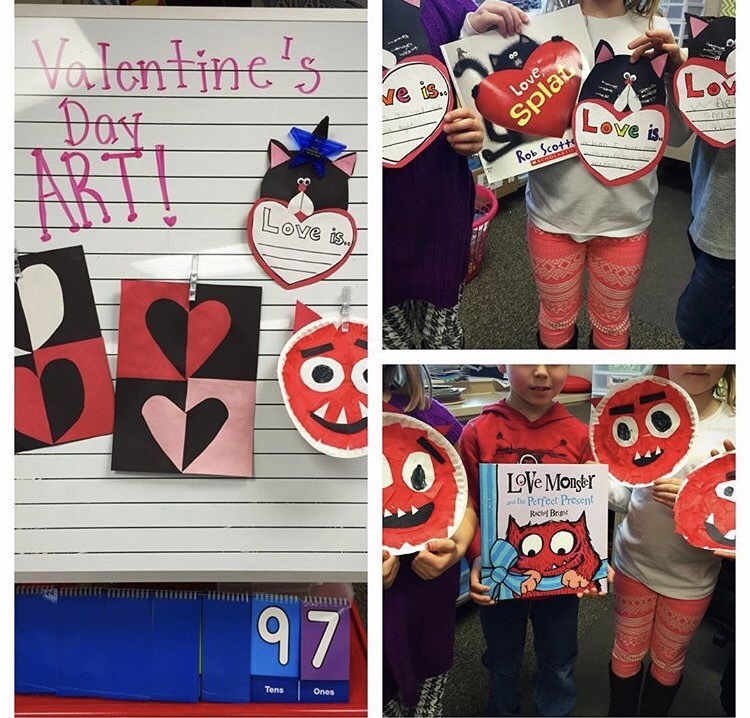 Below are examples of two art projects you could do with your kiddos after reading Love, Splat or Love Monster. I also linked my pins on Pinterest to find step by step details to create these projects below the picture. The one part that young ones would need most help with is writing out their example of what love is, which you could easily write in for them after they told you their idea! They may also need help with cutting and gluing, depending on their age, so that may require a little more prepping beforehand for you. These projects just turn out SO cute afterwards, so a little extra prep up front is worth it! Enjoy and have FUN!